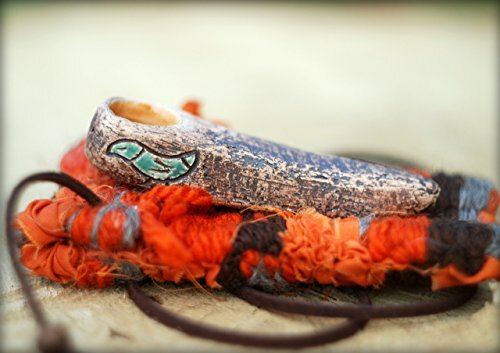 Beautiful pipe with birds) This pipe feels great in your hand or its convenient to hang on the neck in a pipebag! I think this is superunique gift for your best friend or for you. The size of the cover allows you to hide the pipe and small ingredients for it. The cover is handmade and unique. If you're looking for a truly awesome smoking experience this pipe for you) For smoking legal substances only. Dimensions: Length: 7 cm/ 2.75" Width: 1.6 cm/ 0.7" Height: 1.6 cm/ 0.7" Bag size: Length: 10 cm/ 4" Width: 5 cm/ 2"
If you have any questions about this product by CeraMityay, contact us by completing and submitting the form below. If you are looking for a specif part number, please include it with your message.